Bad Weather? We've got great news! For its particular microclimate and geographical aspect, without mountains and winds, is observed on numerous occasions, clear sky and starry nights in Buzios, even when the forecast is more pessimistic. At various times it rains in Rio, Buzios remains sunny. 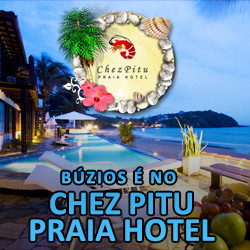 To get an idea, compared with other cities of the state, the average days of sunshine in Buzios is about two times larger than the city of Rio de Janeiro and three times than Angra dos Reis.